When the temperature is freezing and the chill in the air is converting into goosebumps on your skin, there’s nothing like some rich comfort food to ward off the cold. The Swiss cheese fondue comes to mind. 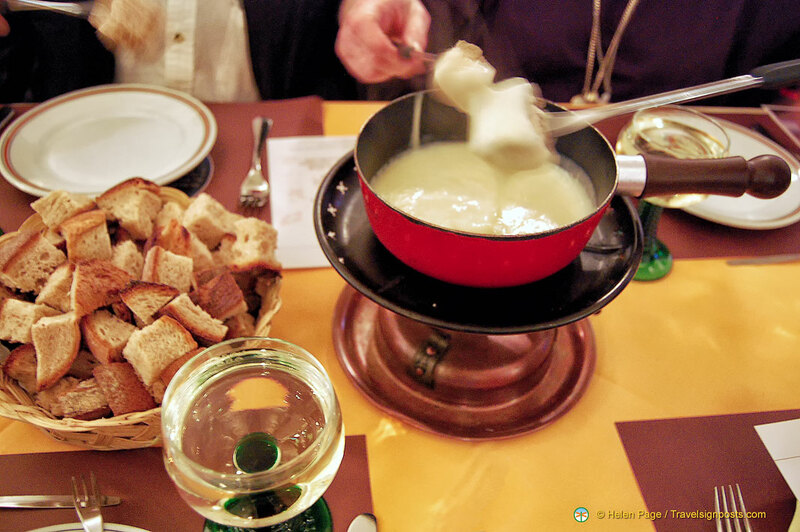 The Swiss cheese fondue, a most typical of Swiss foods, had a very humble beginning. Back in the 18th century, the long winters prevented people in the Swiss villages from getting into town. The foods that they had prepared in summer had therefore to last through the winter months and supplies like cheese and bread got really hard by then. The villagers discovered that if they heated the cheese a little, it got tastier and it became easier to eat. And when they dipped their stone-hard bread into the melted cheese, the bread got softer. Voila, the fondue was invented – the word being a derivative of the French word ‘fondre’, which is to melt. The fondue was a communal food back in the early centuries and nowadays it’s just as good for dinner parties. It is quite easy to prepare, which means that you won’t have to slave in the kitchen, as can be seen from the following recipe. – As soon as the mixture commences to cook, stir in a liqueur glass of good kirsch in which you have dissolved a teaspoon of potato flour or corn flour. – Add a little grated nutmeg and salt and pepper to taste. – A knifepoint of bicarbonate of soda at the last moment will make the fondue lighter. Place the fondue pot on a spirit lamp which can be regulated, with the flame just high enough to keep the fondue cooking gently during the meal. Serve with crusty bread that’s been diced into cubes. Spear a piece of bread with the fork and dip into the fondue. We thought that cheese goes well with red wines, but when we were dining at the Fondue-House in Lucerne, the restaurant manager assured us that white wine was more compatible. After taking his recommendations, Tony agreed with him. If you’re in Lucerne and wish to try some raclette or fondue, the Fondue-House is a good place to go.